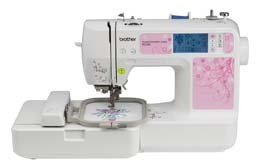 Brother makes quality sewing machines with excellent features for a wide range of crafts and sewing projects. The three machines in this review are perfect for creating beautiful embroideries. One machine of the three also performs other sewing tasks. Let’s look at all three to see which one is the best for you. 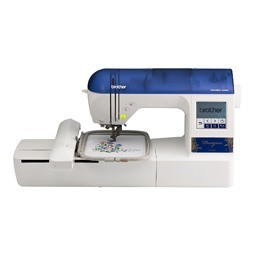 The Brother SE400 is an excellent all-in-one sewing machine, perfect for making clothing, quilting, and crafts. Its extreme versatility is one of the reasons it’s been a top selling machine for years. Besides the sixty-seven built-in stitches, the 70 pre-programmed designs, and five monogram fonts, the SE400 can download even more from your computer once you create an account online. All you need to do is connect the machine to the computer with the included USB cable and install the software.Down the road, you could even create your own designs and upload them. While the embroidery area is limited to 4 by 4 inches, you can do larger embroideries by moving the fabric around. But this is not the only function of the SE400. 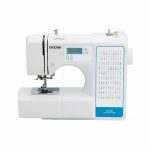 Unlike the other two machines described below, the SE400 can also sew and mend clothing. It comes with ten styles of one-step buttonholes, and an assortment of popular stitches like zigzag and patchwork. Select the stitch you want using the back-lit touchscreen display. The touchscreen displays information about each stitch, including what thread color to choose (for embroideries) and how long it will take to sew that part of the project. The font selector allows you to set small, medium, or large letters. The screen also shows tutorials on how to perform tasks like threading and changing presser feet. 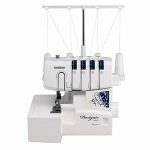 This machine comes with even more handy features, like an automatic needle threaderand push-button thread cutter, as well as a quick-set drop-in bobbin with automatic winding. Sensors on the machine warn when the thread is getting low or has broken. To avoid problems with breaking thread, there is a dial for manual adjustment of thread tension. 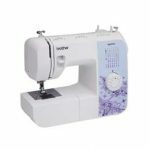 Like many popular sewing machines, the SE400 also offers a start/stop button with speed control so the user doesn’t need to use the foot pedal for control. Everything about this Brother machine is made so that both beginning and advanced sewers can have the best experience possible. Unlike the SE400, the Brother PE500 is made for only embroidery projects. It comes with a 4-inch by 4-inch hoop, 120 patterns, 70 designs, and 5 monogram fonts already pre-programmed. If those aren’t enough for you, you can use your computer to upload more to the machine. You will need to install software on your computer and use the included USB cable to link it to the PE500. You may also need to create an account at iBroidery.com. The backlit touchscreen display will help you select the correct thread and set up the machine for the pattern you want to create. It has built-in tutorials to teach new users how to thread, wind the bobbin, and more. There are also images printed on the machine to remind you how to complete certain functions. The PE500 can sew on a wide range of fabrics, from denim to silk. If the 4 by 4-inch hoop isn’t large enough for your intended project, don’t worry. You can move the fabric around in the hoop to make larger designs. You can also use the machine to control the size of the lettering font. The built-in work-light is bright enough that you won’t need an additional task lamp to see what you’re sewing. 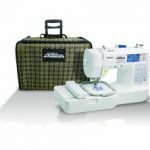 While it may only be an embroidery machine, the PE500 has helpful functions to make sewing easier. 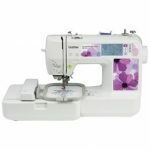 It features an automatic needle threader and quick-set drop-in bobbin. You can also trim top and bottom threads with the push of a button. If the 4 by 4-inch embroidery hoop is too small for your projects, you may prefer the 5 by 7-inch hoop on the Brother PE770. Like the PE500, this is an embroidery-only machine. 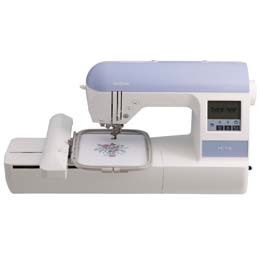 If you want to embroider and sew, check out the SE400 at the top of this review. Besides the larger hoop, the PE770 comes with more pre-programmed designs. It has 6 fonts instead of 5, and 136 patterns. Of course, you can upload new designs to your machine with the included USB cable or your own USB flash drive or a Brother embroidery card. You can customize each design by rotating it, flipping it, or changing the size. The backlit LCD display gives you a preview of how it will look. It will also tell you how long it will take to sew the design. 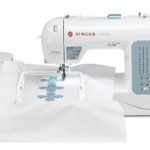 Although it’s an embroidery machine, and it doesn’t do common sewing functions, it has time-saving and user-friendly features like an automatic needle threader and quick-set drop-in bobbin. You can push a button to trim top and bottom threads.But it doesn’t have all the user tutorials and help features printed on the machine like the PE500 does. 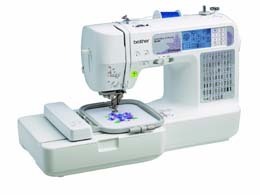 If you would like the convenience of being able to both sew and embroider with the same machine, get the SE400. It’s very user-friendly for all levels of sewers. If you want to begin embroidering with a machine, and you don’t mind re-hooping projects larger than 4 by 4 inches, get the PE500. It has a lot of user tutorials and helpful features to help you have the best experience possible. If you’re experienced with machine embroidering, and you want a larger hoop and more pre-programmed designs, get the PE770. Click here to purchase Brother SE400 on Amazon.com! Click here to purchase Brother PE770 on Amazon.com!